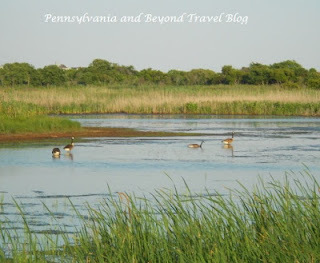 My husband and I love going to see wildlife in their natural habitat so when we were recently down to Cape May, New Jersey...we just had to stop in to The Nature Conservancy at South Cape May Meadows. 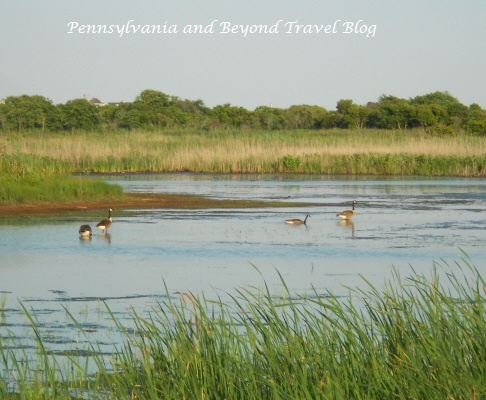 This is a beautiful nature preserve that is totally free to enjoy and there is plenty of free parking too! Right before you enter the nature preserve you can stop to read the information about the wildlife that lives there via a few informational reading boards that they have at the front gate. You will then pass through the gate and we took the path on the right. These are unpaved paths but very flat and even walking. As someone with health problems, I had no problems walking through the Nature Preserve. 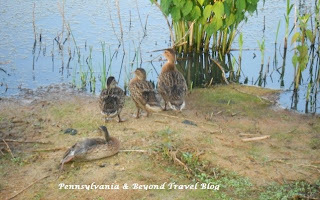 As you walk along the trail you will see beautiful fresh water marshes and as we were going along the paths we ran into an adorable duck family. 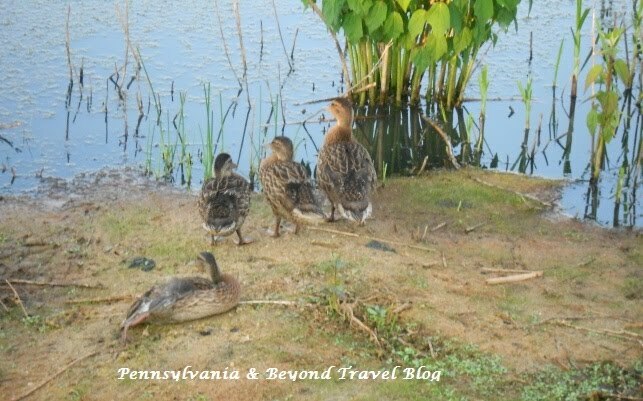 They were sitting on the bank (their backs to us) and just looking out at the water. We found them to be totally adorable and they didn't run (fly) away as we stood there watching them. 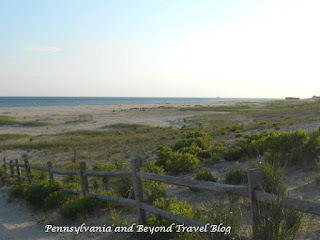 We continued down the trail and finally reached the private undeveloped beach area. As you stand there looking out over the Atlantic Ocean you realize how beautiful this area really is. If you look to your right you can see the Cape May Lighthouse off in the distance. Since I am a beach and ocean lover, this was my favorite part of the entire preserve. 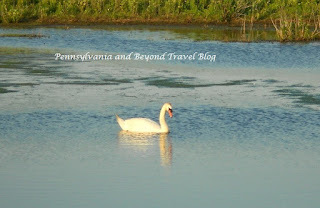 We then rounded the corner and headed towards the other side of the nature preserve and ran into a mommy swan who was sitting on the bank of the marsh. 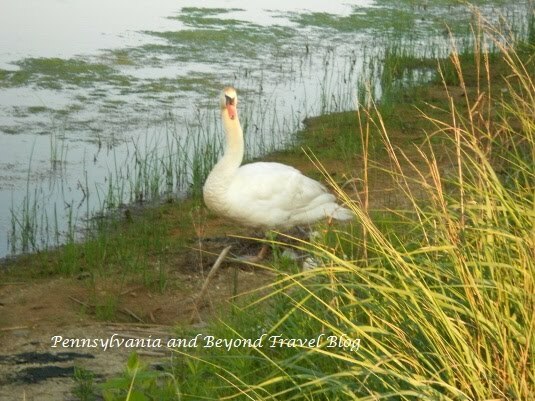 We were standing there watching her and then all of a sudden we realized that she had 3 baby swans tucked into the grassy part of the marsh and you could barely see them. We found a bench and decided to sit down and watch this swan family for quite awhile. 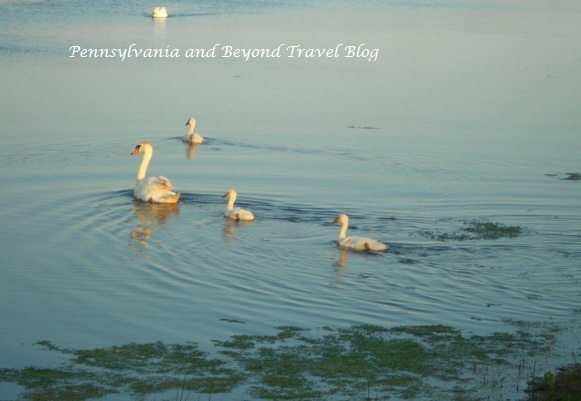 After about 20 minutes we finally saw mommy swan lead her 3 baby swans out into the water for a swim. Wow, they were breath-takingly beautiful to watch! It was starting to get dark so we headed down the trail towards the exit gate and ran into one last family. This time, a beautiful family of Canadian Geese! There were several of them out there in the water and they didn't care that humans were nearby. 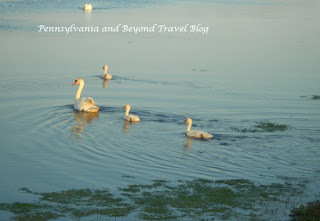 My husband particularly liked watching the Geese family play out in the waterway. Take the Garden State Parkway South to the end where it merges into Lafayette Street in Cape May. Continue straight on Lafayette Street. Bear right onto West Perry Street. This will turn into Sunset Boulevard, drive west for one mile. The preserve is on the left just past Bayshore Road. We hope you will visit the Nature Conservancy at South Cape May Meadows the next time you are in the Avalon, Stone Harbor, Wildwood and/or Cape May New Jersey area. We loved it so much that we are looking forward to visiting again come September 2012.